This pattern captures my shabby chic heart! 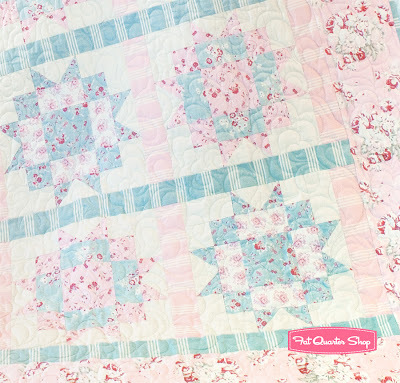 Country Rose is so easy and soooo pretty. I imagine this quilt spread over a vintage iron bed in a little cottage tucked away in the countryside… but I admire it equally in my room! As you may know, stars are my vice, and the faded colors of Athill Range make these stars soft and elegant. I love the unique sashing of this quilt, a little surprise in an otherwise traditional pattern! 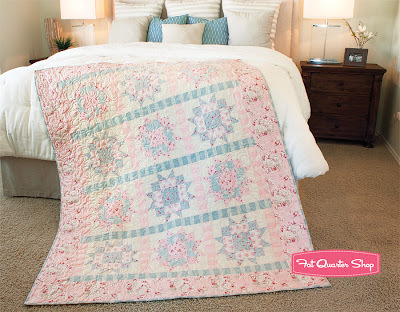 There is nothing about this quilt that I don’t absolutely love! So simple but so perfect and sweet. This one is a keeper for me and my sweet pea Emma! Store owners, you can find Country Rose as ISE-124 at United Notions and Checkers!